When I made my list of goals for this year in Indonesia at the start of my Fulbright grant, “reenact the colonial period” was not exactly an aspiration that came to mind. Similarly, getting in touch with my Dutch roots by becoming the face of imperialism in Indonesia is probably not the kind of “promotion of international goodwill” that Senator William Fulbright envisioned when he drafted the bill for his namesake program in 1945. But Indonesia has taught me to (among many other things) expect the unexpected and handle many unanticipated situations, bizarre as they may seem, with grace. 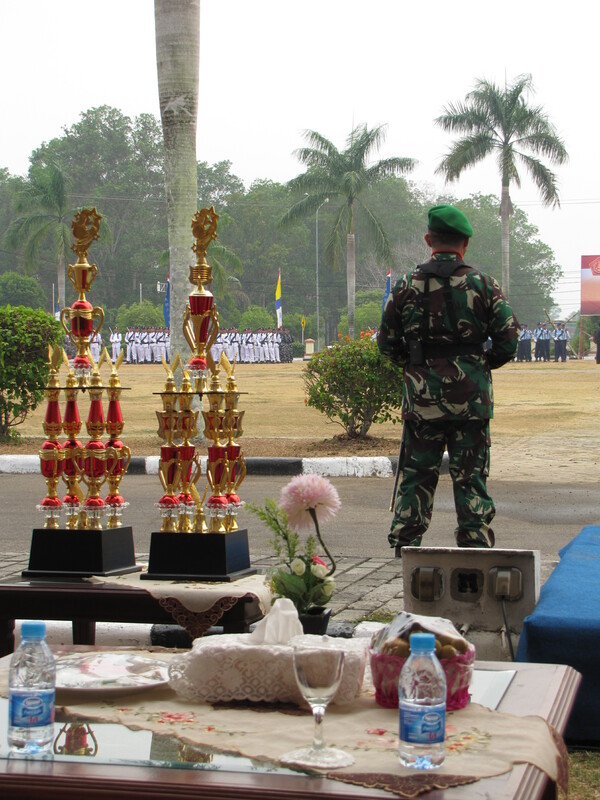 Hari Tentara Nasional Indonesia celebrations underway. And so it happens that on the morning of October 5, 2015 I became a General in the Dutch army circa 1949. The fifth of October is one of many national holidays in Indonesia. 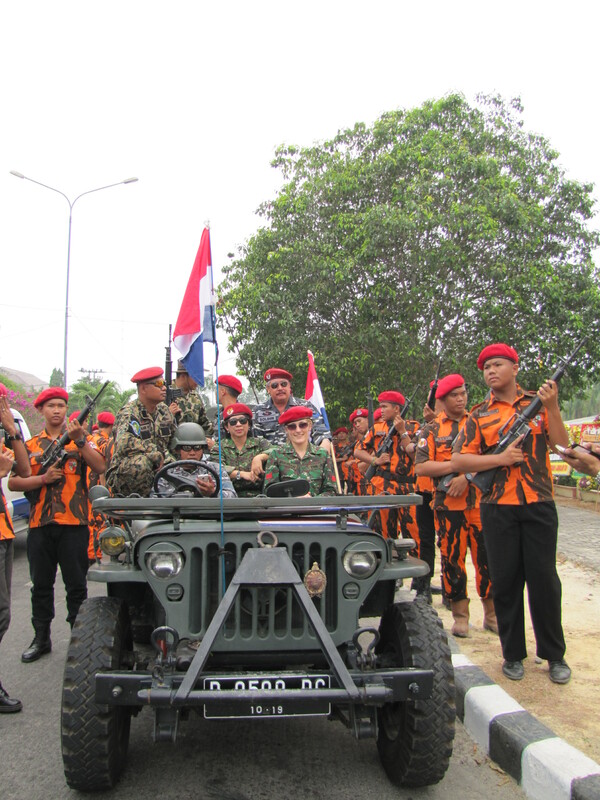 It is Hari Tentara Nasional Indonesia, or Indonesian National Armed Forces Day. This day is celebrated as the birthday of the modern Indonesian military which means that there are parades, ceremonies, and lots of speech-making across Indonesia. Bangka-Belitung province went all-out in 2015 for the military’s 70th birthday by orchestrating Drama Kolosal, a theater performance of epic proportions. Drama Kolosal tells the story of the foundation of Tentara Keamanan Rakyat (TKR) [People’s Security Army] and the Indonesian struggle for independence from the Netherlands in the 1940s. By the powers that be in Indonesian politics, students at my school were chosen to participate in the festivities. For two weeks prior to the October fifth performance of Drama Kolosal, students at SMAN3 Pangkal Pinang had an alternate schedule in which classes started two hours later than usual. During this time, nearly all of the male students assembled on the dusty soccer field at the back of our campus and rehearsed a school-wide game of war. Actual members of the Indonesian military were regularly in attendance to help direct the rehearsal. Male teachers drifted through the scene, taking turns barking orders through a megaphone. An impressive sound system was set up in the shade of some trees on the perimeter of the field. From the booming speakers an ominous voice narrated the mock-battle, interspersed with recorded sounds of fighting and battle cries. The morning of Hari Tentara Nasional Indonesia, a Monday my headmistress Ibu Kun approached me before the weekly flag ceremony. She asked if I would like to accompany her to watch our students perform, and before I knew it we were in a SUV on our way to the Kantor Gubernur [Governor’s Office] where Drama Kolosal was being performed. Sitting in the shade with the oh-so glamorous ibu-ibus. It was easy to tell when we had arrived because busloads of spectators were converging on a gravel parking lot in the back of the office, disgorging passengers at will. Rows of uniformed students and soldiers were already standing in formation on the road flanking the side of the building. 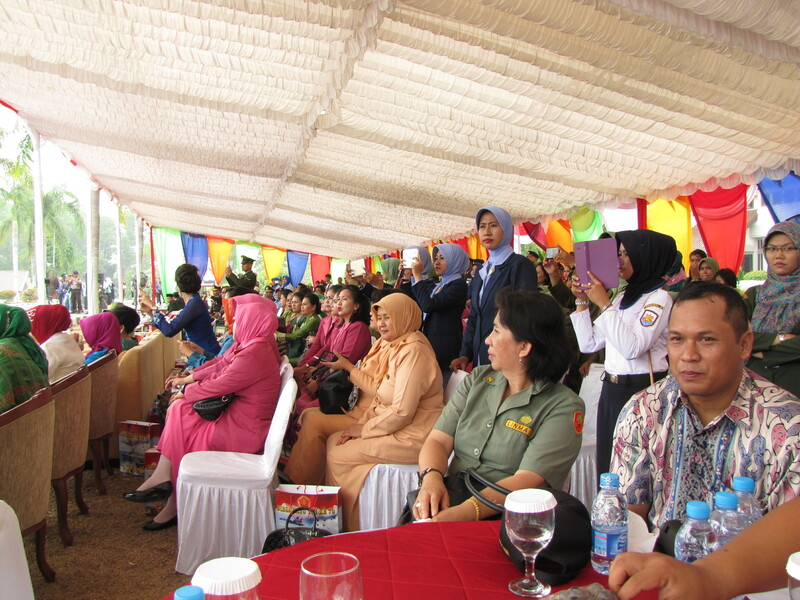 My headmistress and another ibu from my school took turns grabbing my arm, guiding me to the rows of chairs shaded by the giant, temporary tent that is the hallmark of outdoor events in Indonesia. We sat with the glamorously-adorned wives of various important military personnel. As I shook hand after hand, I marveled at their ability to navigate gravel while wearing six-inch heels and binding silk skirts. Two of the five bupatis (high-ranking regional officials) of my province were in attendance as well as the governor and the mayor of Pangkal Pinang. I was duly introduced to them before finally being allowed to take a seat and watch Drama Kolosal unfold. We had been sitting for perhaps ten minutes when, after a series of conversations in rapid-fire Indonesian, my headmistress beckoned for me to join her. We were directed into the lobby of Kantor Gubernur and from there we were taken through a series of doors. Somewhere along the way a full military uniform — fatigues, belt, boots, and all — appeared out of thin air. I was unsure of what was going on, but I followed my headmistress’s lead and soon the two of us were in a carpeted, air-conditioned office of none other than the governor himself. She held up the fatigues against herself to gauge the fit and, apparently satisfied, proceeded to undress. I was surprised to see my headmistress strip down to her knickers, but quickly fell into step by helping her fold discarded clothes and lace up the military-grade boots. Yours truly, front and center, waiting in the wings of Drama Kolosal with my soldier-students and actual members of the Indonesian military. Once she stood before me, combat-ready, it was clear that she intended to join in the Drama Kolosal. We exited the A/C and were taken deeper into the warren of administrative offices. In hindsight I now realize that our escorts were looking for a uniform for me to wear, a fact that I was unaware of until someone took off his jacket and handed it to me. There were no combat boots or cargo pants for me, but I did receive a red beret and had the foresight to bring sunglasses, which completed the look. Once we were suited up, we were escorted outside to a vintage Jeep that was flying the Dutch flag. Ibu Kun climbed into the back and — you guessed it — I was seated in the front passenger seat. A small cadre of students from my school flanked both sides of the Jeep, wearing orange fatigues and carrying actual rifles. They greeted me and were apparently as surprised as I was about this turn of events. I answered the usual questions posed to me by the members of the military I was now sharing a ride with, with an additional line of questioning to clarify that I was not actually from the Netherlands and therefore could not speak Dutch. We, the Dutch army, waited in the wings for our cue. After a bit of waiting, we were given the signal and the Jeep lurched forward. Ibu Kun whispered instructions into my ear. I didn’t understand everything, but I picked up serius [serious] and mati [die]. Apparently I was to be serious and then I would die at the end of the act. The Jeep rolled into view of the spectators. Let my acting/military career begin. At first I had to bite the inside of my cheeks to keep from laughing at the absurdity of it all. Here I was, not even two months into my Fulbright grant and trying so hard to find avenues for cultural exchange, and somehow I ended up being cast as an imperialistic aggressor. This was only for the sake of theater but I felt uncomfortable to have all of the eyes of my province on me while I played this role. Discomfort or not, the show must go on. My role was easy. All I had to do was wait for my cue to die and hold a straight face in the meantime. The latter proved easier to do as the drama went on because the Drama Kolosal re-enactment of Dutch treatment of Indonesians was more graphic than I was expecting. Our Jeep rolled onto the grass and my student-soldiers jogged along in formation. In the center of the field a gaggle of students dressed as villagers waited for our arrival. The Jeep slowed as we approached and the narration of Drama Kolosal continued over the loudspeakers mounted on palm trees around the field. On cue, my student-soldiers shouldered their rifles and opened fire on the hapless cluster in the middle of the field. The rifles were loaded with blanks and the smell of gunpowder accosted my nostrils from point-blank range. The student-villagers screamed. Some fell to ground. The Dutch soldiers, my students, advanced on the villagers and dragged them off one-by-one, screaming and struggling. I felt tears stinging my eyes and it wasn’t just from the gunpowder. The assassin meeting his mark. The path thus cleared, we advanced to do a lap around the field. During this lap, Drama Kolosal continued. At least one hundred students, all wearing white, gathered at the far end of the field. This portion of the play was heavily narrated (and unintelligible to me) though it was clear that the army in white was the Indonesian resistance. On our second lap around the field, orange and white clashed in combat, fighting with sticks, swords, rifle butts, and bare hands. The students took to their roles with such zeal that it was hard to believe it was acting. We, the Dutch, were victorious again but it was a close victory. We made another lap around the field and the narration continued. On our third round, two lookout posts made out of sticks appeared in the middle of the field. We parked behind these posts, facing the army of white that was once again assembling. Two of my student-soldiers broke rank to take up posts as lookouts atop these precarious positions. We waited. The sun showed no mercy. Not a breeze stirred. Even the sweat on the back of my neck was tense. After a seemingly interminable amount of time had passed, there was movement among the Indonesian resistance. The student-soldiers dressed in white advanced toward us slowly. Two of them crept ahead of the formation, shimmying on their hands and knees toward the lookout posts. The sentries atop those posts maintained a steady gaze on the advancing army and were oblivious to the assassins quickly closing in. The audience’s anticipation was palpable. When the assassins met their mark and my orange-clad student-soldier-corpses dangled from their lookouts, a great cheer went up from the crowd. With that, the Indonesian army surged forward and more blanks were fired. “Mati mati mati, Kelly, mati!” Die die die, Kelly, die! That was my cue to slump over, the grand finale of my nascent acting career. I leaned into the driver, whispering a quick apology — maaf, ya? — for utilizing the facility of his shoulder. I cracked one eye open under the cover of my sunglasses to watch the Indonesian victory unfold. In less than a minute, all of my Dutch student-soldiers lay in the dirt. Mambo Square and the Bangka Pos both featured my participation in Drama Kolosal on their front pages. 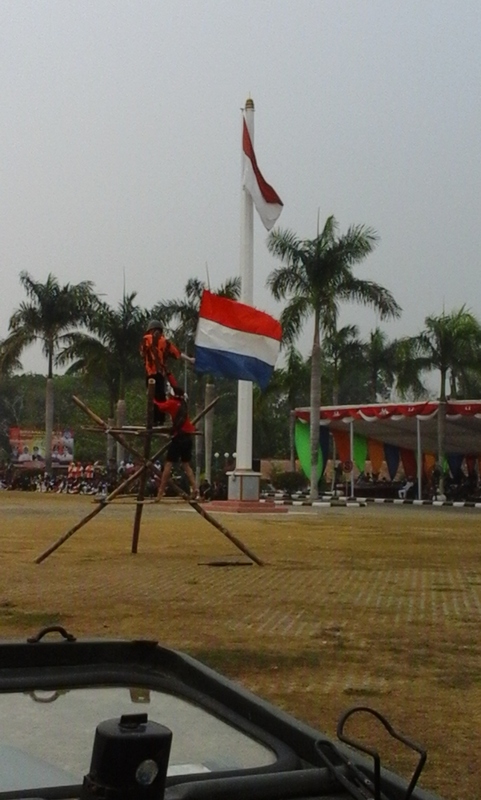 One of the Indonesian military members let out a rallying cry: Bendera! Bendera! The flag! The flag! The Dutch flag was ripped off the front of the Jeep and taken down from the lookout posts. Another cheer erupted from the crowd and members of the press swarmed our Jeep as the Indonesian military retreated to begin the next act of Drama Kolosal. Meanwhile, we played dead for no less than five minutes while photo after photo was taken. This concluded my brief acting career. The following day I made headlines, appearing on the front page of at least two local newspapers. While it was fun to participate in such a large-scale performance, the cultural implications of my participation in Drama Kolosal have prompted me to reflect on the lasting impact of colonization on much of the world. The events of the past create the context of today, which can keenly be felt in Indonesia. The Netherlands’ impact persists in Indonesia in the government’s bureaucratic structure; in the fierce independent spirit of many Indonesian people; and in the separatist struggles that have been largely resolved in Aceh and but persist in Papua which began because of territorial agreements made between Indonesia and the Netherlands. By participating in Drama Kolosal, I willingly symbolized the blue-eyed, blond-haired colonizers of Indonesia’s past. I also reflected on how my Dutch ancestors likely drank tea and used spices grown in Indonesia and how they probably never would have imagined that one of their descendants would some day come to a land that, to them, was nothing more than a distant, exotic source of wealth. I am eternally thankful to the Fulbright Program for making cultural exchanges such as this possible and to my school, SMAN3 Pangkal Pinang, for welcoming me into every celebration even if I do have to play a less-than-savory role. Together, we are creating history for a better tomorrow. Kelly Fitzgerald is currently a Fulbright ETA in Pangkal Pinang, the capital city of the beautiful but lesser-known island of Bangka. She was born and raised in Chicago and is a recent graduate of the University of Tampa. When she is not teaching she enjoys making lists, laughing way too much, and exploring Pangkal Pinang. You can follow her blog at http://mskellyfitzfulbright.wordpress.com/. Thanks for sharing this life experience with us.And front page of the newspaper; awesome! I’m Indonesian by birth, and I found this amusing. Thanks for sharing. I am officially Indo-famous. This article, which I wrote for Indonesiaful last year, explains the incident of how this came to be. “What sort of a tale” have you “fallen into” this time, Kelly? My, you do live an exciting life and I love reading your adventures. Life is a story and yours is one of the best! I hope you write a book one of these days. It will be a good read. Love you bunches!!! My goodness Kelly, the stories keep coming. And as I so often remind you, I love your writing style and abilities. You can always go to work for the New York Times if your acting career goes south. You will treasure your accounts of these times. I am continually very proud of you.